Travel vectors (lines between sequential GPS points) of collared coyote Bonnie show a hotspot at a local farm with food attractants. Red represents daylight points and paths of travel, blue during darkness, purple during twilight. 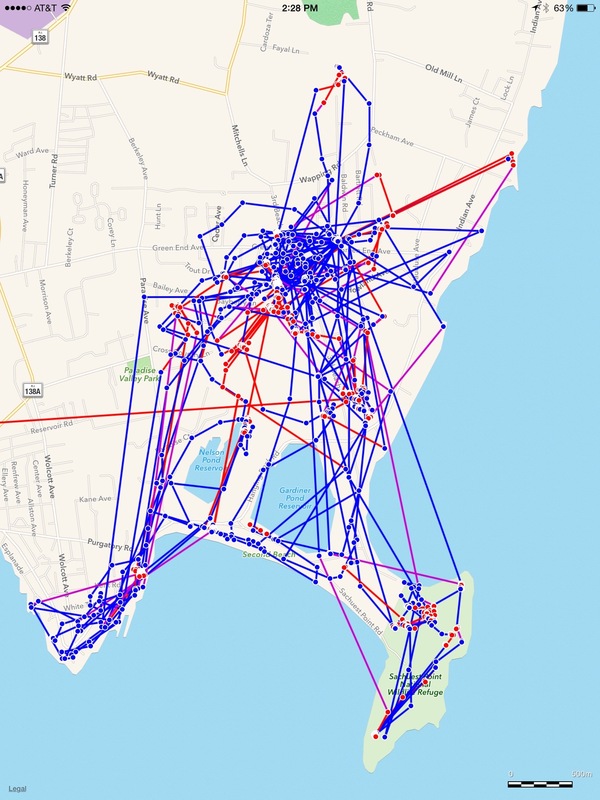 In addition to our research applications, as a community service, NBCS uses GPS collar data to conduct forensic tracking (identifying coyote feeding sites) when requested by town police. Based on numbers of coyote complaints between Wapping Road and Green End Avenue, Middletown, Chief of Police Anthony Pesare asked us to investigate. In the spring and summer of 2015, movements of Bonnie and George, two GPS-collared coyotes, quickly pointed to places they were regularly getting fed – unintentionally. Activity hotspots were found around two farms in the area of Green End Ave., between Third Beach Road and Indian Ave, in Middletown. One of the farms lies 300 feet from a neighborhood that reported increased coyote traffic and two dog attacks last winter to NBCS. The farmers at both sites have been very helpful and have pledged their intentions to fix the problem as specified by the Middletown “No-Feeding Ordinance” that prohibits leaving out food attractants for coyotes. 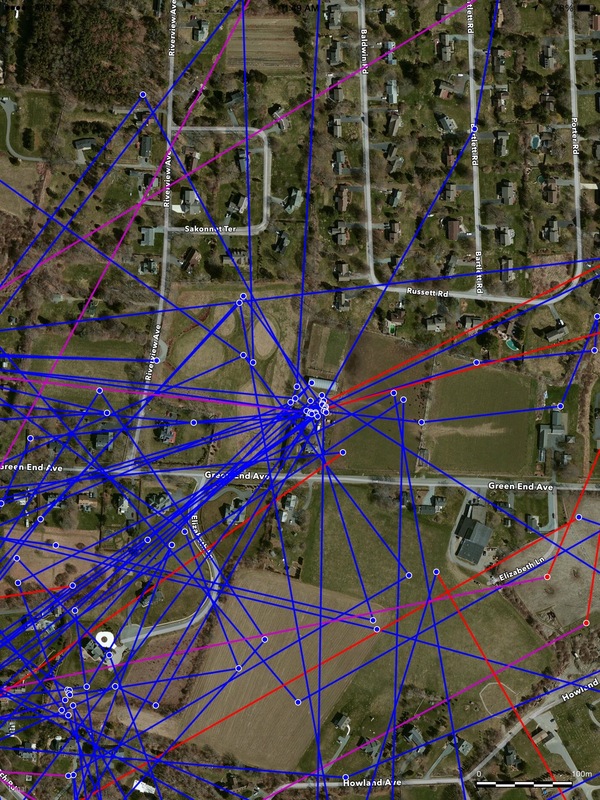 In April, within two weeks of being collared, Bonnie’s travel vectors (lines connecting sequential GPS points) showed she regularly visited a farm with pigs on Green End Ave. (Figure 1; in all figures blue points and lines signify nighttime positions and travel, red lines and points daytime positions and travel, purple lines indicate twilight travel). Bonnie crisscrossed neighborhoods between the farm and brushy shelter sites she occupied (Figure 2). A visit to the hotspot revealed pigs (and, unbeknownst to farmers, coyotes) that were being fed with large piles of restaurant scraps. The farmers had no idea they were creating a problem for nearby neighborhoods but tracking data clearly show they regularly passed through even though an aggressive hunting program was in effect. Not surprisingly, one hunter reported this farm was the best place to shoot coyotes and reported taking six or more there. 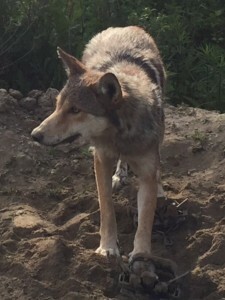 The hunting did not change the coyote traffic pattern or eliminate the coyotes in the area however. Movements by coyote Bonnie and and a fellow Sachuest pack member, George (collared in May, Figure 3), revealed another farm subsidy later in the summer. Travel vectors of both animals converged on a community farm where household garbage was being composted by growers. This farm proved to be a hangout for both animals. George also rested close by during daylight hours (Figure 4). Families who have farmed here for generations have not had to consider coyotes and their impacts: coyotes have only been on the islands since the mid-1990s. There are now a couple of things farmers need to consider. First, to protect their investment and bottom line, most local farmers have already modified their methods to accommodate inevitable coyote presence. For example, most have good fencing, bring in small animals at night, and some have guard animals (best we have seen are llamas, or great Pyrenees mountain dogs) constantly in the field with them. In order to avoid coyotes shifting from natural foods (mice, woodchucks, etc.) to livestock predation, most farmers know to never let coyotes get a taste of livestock they are trying to raise. It is also important to completely dispose of livestock remains where coyotes can’t get them for the same reason. Second, farmers need to consider if their current practices are attracting coyotes and impacting neighbors. Food left out for farm animals, groups of barn cats, and edibles (scraps of meat, vegetables, fruit, or carcasses) in compost piles, will attract coyotes. With the pressure and pace of coastal development, island farms are frequently surrounded by residential neighborhoods. Farms with a cornucopia of coyote attractants will become a hub of coyote activity. Coyotes packs, family groups which patrol and defend large territories from other coyotes, will spend most of their time near regularly available food resources (Figure 5). NBCS forensic tracking with GPS collars indicates adjacent neighborhoods will experience reduced coyote traffic, and fewer coyote problems, if farmers change feeding and disposal practices.